Plakias can offer you a unique experience from the boat. 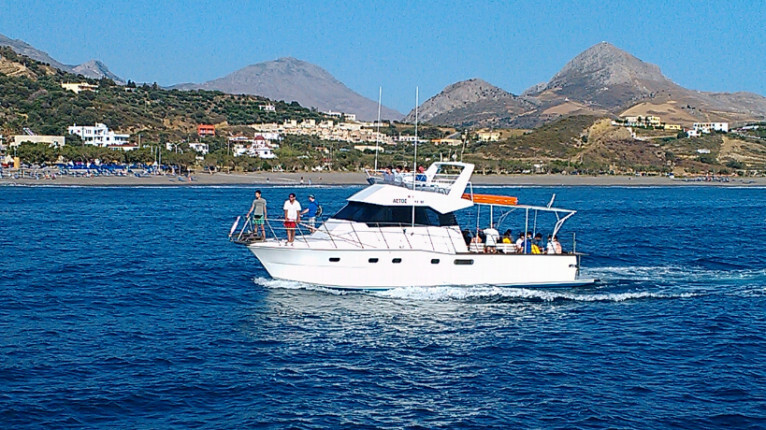 You can discover the south coast of Crete and visit beautiful beaches, while the view from the boat is more than worthwhile! The boat takes you to this area rich in vegetation and where the river from the Kourtaliotiko gorge flows into the Libyan Sea. The palm forest is the second largest forest of Crete, a real oasis! Visit 3 different beaches during a day trip and enjoy the sun, sea and beautiful beaches. You can swim, snorkel, dive and forget time along the southern coastline. 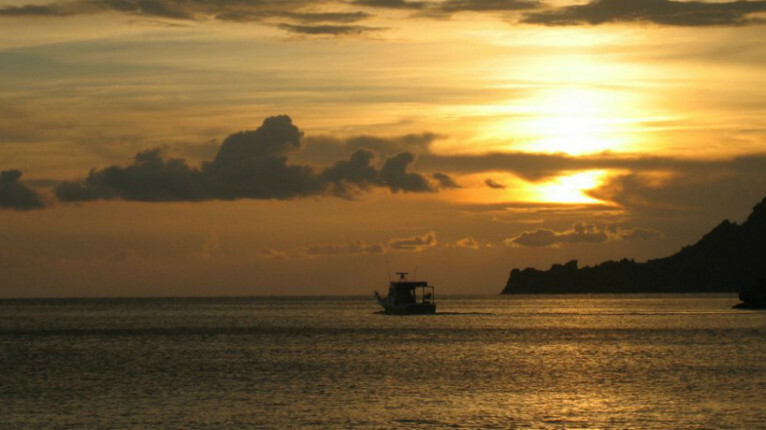 An excursion for anyone who wants to combine something special, like sun, sea and sand. During this refreshing excursion you can enjoy a wonderful relaxed boat trip, a visit to Marmara Beach and the village of Loutro. From Plakias we sail with Captain Lefteris in about 1.5 hours to the beach of Marmara. We make a stop so you can swim here, and if you fancy you can walk to the entrance of the gorge of Aradena to make some beautiful pictures. The impressive gorge of Aradena begins north of the village of Aradena –aboandoned nowadays-, from the Lefka Ori Mountains, and ends in the sea south of Aradena. After this (swimming) break we go to the beach of Phoenix, where in a local tavern you have the opportunity to enjoy your lunch. Lunch is not included in the tour price. After lunch we continue our relaxing trip by boat to the village of Loutro, which is only accessible by boat or on foot. Here you can take a little walk around the village or, as you wish, freshen up in the clear, cool waters of the Libyan Sea. Loutro gets its name from the Greek word for bath “Loutro” and ancient baths are also found in this area. Furthermore Loutro is thought to be the ancient city of Finikas (as the area is now called) but Loutro was definitely the port of ancient Anopolis. Later in history Loutro became the winter harbor of Sfakia because it was a closed bay with a small island at the entrance so ships always found a safe haven here, even in bad weather. 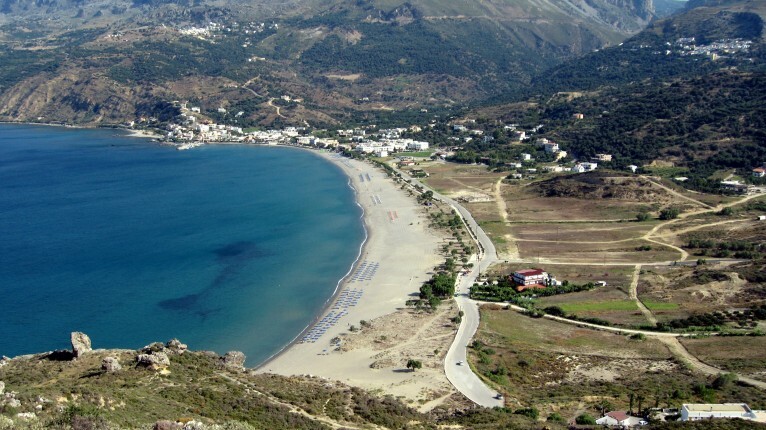 After all this, and perhaps with a nicely tanned complexion, we will return back to Plakias. Do not forget plenty of sunscreen, a swimsuit and bring a towel! During the boat trip you will visit three beaches. An excellent way to enjoy the sun and the sea! There is ample opportunity for lovers of snorkeling to explore the underwater world, but also for those who just want to spend a relaxing day cruising along the coast, in the meantime forgetting all about time, this cruise is a must … We leave at 09.30 from Plakias and sail to Preveli Palm Beach consecutively, the beach of Agios Pavlos and finally we set sail for the bay at Triopetra. 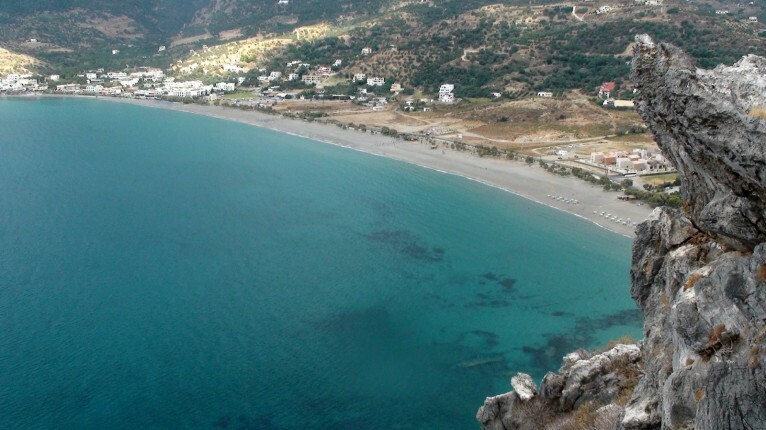 Around 17.00 hrs we return in Plakias.